A while back a reader asked me to post about goals and objectives, and I never did, so I’m sorry dear reader! It’s a bit belated but here you go. This is the handout I made for our Instructors In Training based on several handouts I already had. Hope this helps! Therapeutic riding instructors generally set goals and objectives for their students. Most barns require this as a way to promote and track progress. Therapeutic riding goals are based on the rider’s Life Goals, given by the participant or family in their paperwork or personal conversation. Ex) Ride a bike. Ex) Sit on a bench to watch his brother’s baseball game. Ex) Tie his shoelaces. Instructors create Therapeutic Riding Goals to help these riders meet their Life Goals through their riding lessons. Riding Goals are specifically related to riding. Ex) Improve posting trot. Therapeutic Goals may include Physical, Cognitive, and Social/Emotional goals. Ex) Increase fine motor skills. Note: Some barns require that all goals be riding goals, others will incorporate therapeutic goals too. I mention both so you are prepared wherever you end up teaching. When making goals, consider both long or short term goals. Some barns will require a certain one. Short Term Goals are to be achieved in several weeks or by the end of the quarter. Ex) Will learn horse parts. Rider’s Life Goal: Ride a bike. Instructor sets her Therapeutic Goal (Physical): Improve coordination. and/or Instructor sets her Riding Goal: Demonstrate direct rein steering. Note that both goals relate back to skills needed to achieve the life goal. Objectives break down the goals into specific measurable actions you want to focus on in your lessons. 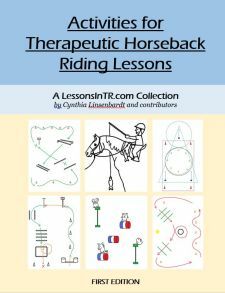 Objective must be a riding skill because primarily we are riding instructors, not therapists. 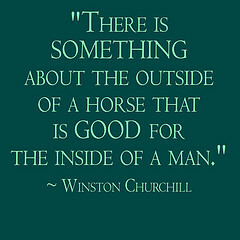 A riding skill is the use of aids to attempt communication with the horse. Ex) Sally will demonstrate direct rein steering 3 out of 5 attempts during 1 lesson, with minimal leader assistance and no sidewalkers. Ex) Sally will demonstrate direct rein steering 90% of the lesson, with a leader, no sidewalkers, minimal verbal prompts. Different barns require different goals and objectives. Ex) Barn #1 requires 2 Long Term Goals, 2 Short Term Goals that support the Long Term Goals for every Quarter. For every lesson they require 1 Objective to meet those goals. Ex) Barn #2 requires 3 Goals, and 2-3 Objectives per goal, but the instructor is not required to work on every single objective each lesson. To be able to post at the trot independently, demonstrating correct posting rhythm, for 5 minutes. Rider will demonstrate a posting trot 1 time around the arena in each direction, assistance as needed. The rider will trot on the correct diagonal 4 out of 6 tries with verbal cues. The rider will perform 2 point for ¼ of the arena with both arms out to the side 1x in each direction. X will demonstrate 2pt for 3-5 seconds 2 weeks in a row. X will name 5 parts of the horse 2 weeks in a row. X will sit in correct riding posture for 10 seconds at a time 2 weeks in a row.